I have enjoyed my role as forensic art consultant for the CSI: television franchise for many years. I have always viewed it as an opportunity to encourage accurate presentation of forensic art to the viewing public. Though “Hollywood” considerations have sometimes over-ridden my advice, my experience with the shows has always been a positive one. For the CSI:NY episode “American Dreamers”, I was asked to consult with writers, prepare sculptural props and travel to Los Angeles to act as an on-set consultant for the actors. This can be a demanding and stressful task but I have always embraced it. The earliest step was to consult with writer Eli Talbert about how he hoped to utilize forensic art as an integral part of the plot he was crafting for the episode. I prepared a storyboard of sketches to give an idea of the various stages of the props I could develop. This allowed insight so that the director and producers could more precisely plan a shooting schedule for the facial reconstruction action, once the time crunch of filming actually began. In advance of my travel to California, I created the prop facial reconstructions in multiple steps, sort of like it is done for cooking shows. It would be far too slow for me to do a finished sculpture while the actual filming was taking place. Instead, the plan was that one step would be filmed, then the next and so on. Once edited together, the viewer would get the sense that it all happened as a smoothly flowing process. The multiple steps I made were then shipped ahead before my arrival for filming. For this particular episode, actress Vanessa Ferlito portrayed CSI “Aiden Burn” who was doing the sculpted facial reconstruction. She listened carefully to my guidance and worked very hard to accurately achieve the impression that she was doing the sculpture. Once shots of my hands working were interwoven with shots of hers as part of a “process shot”, the effect was totally realistic. They kindly allowed my book, Forensic Art and Illustration, to appear in the shot on Aiden’s work table. My time on the set is always challenging yet fun. I enjoy the interaction with writers and production staff as well as the actors. All in all, this episode was loads of hard work and I feel that it turned out well. It boggles my mind a bit that the work I did was viewed by so many millions of people. I do particularly like the fact that fictional police procedural television shows have great power to generate interest in real-life crime issues. Over the years, I have come to truly admire actor Gary Sinise and the tireless work he has done for American military personnel and veterans. Though he is “Detective Mac Taylor” on CSI:NY, he will forever be Lieutenant Dan! 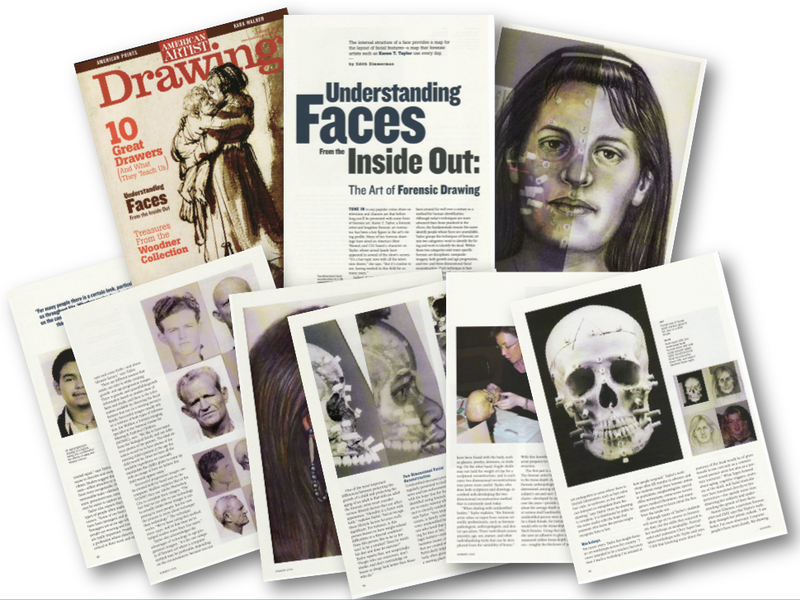 I was very fortunate to be the subject of an article that appeared in American Artist: Drawing magazine. This piece was done by New York writer Edith Zimmerman and appeared in the Summer, 2006 issue. The title is “Understanding Faces From the Inside Out”. In 2004, I was interviewed for the Houston Chronicle by reporter Evan Moore for an article that appeared in the Sunday supplement magazine called “Texas”. 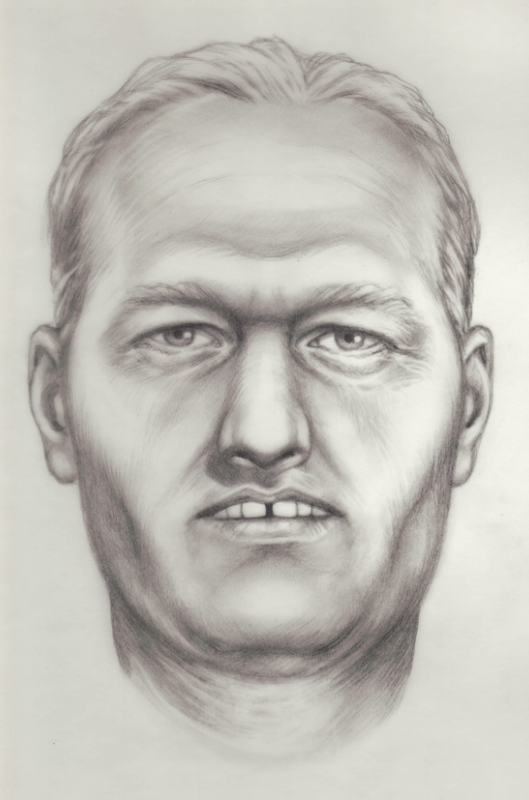 Mr. Moore had a genuine interest in the field of forensic art which resulted in a story that helped to bring positive attention to the field at large. Interviews of this type provide the opportunity to alert members of the general public about the benefits of this work. It also helps citizens to understand the unique efforts made by law enforcement personnel for the sake of public safety. I was asked by ABC Television and Disney Studios to create a skull, life-size skull photographs and facial drawings for use as “forensic” props on the television series Body of Proof with Dana Delany and Jeri Ryan. These photos show the scope of the project and how it actually appeared on the show. The Season 3 Finale episode (#313) was called “Daddy Issues”. It was written by Corey Miller, directed by John Terlesky and produced by Matthew Gross. This is a shot taken on the set, courtesy of writer Corey Miller. An important element of the plot dealt with the dental morphology of an “unidentified victim”. As part of the consultation I did with the writer, I suggested that this dental detail would be a useful tool to add authenticity to the props I was preparing. I then modified an existing skull to add a large space between the maxillary central incisors called a diastema. This was done by individually sculpting the teeth and painting them in a naturalistic way. A corresponding photo of this gap-toothed “victim’s” skull was also created with the assistance of Dreamfly Creations. A close-up of the gap-toothed dentition is shown. This fictitious “victim” needed the assistance of 2-dimensional facial reconstruction to aid with his identification! I assembled drawing boards for two different stages of filming. A life-size photo of the skull is overlaid with transparent vellum so that drawings can be done over the skull. I set up a partially complete drawing as well as the finished drawing so it could be shot in stages. This is a forensic art procedure that I developed in the early 1980s while working for the Texas Department of Public Safety. I am grateful to say that it has been used to identify many hundreds of actual homicide victims. I taught the method for over twenty years at the FBI Academy in Quantico, Virginia. I continue to teach this effective, direct method at the Scottsdale Artists’ School in Arizona. This beautiful rainy shot was created by cinematographer Patrick Cady to showcase actress Jeri Ryan portraying Dr. Kate Murphy. 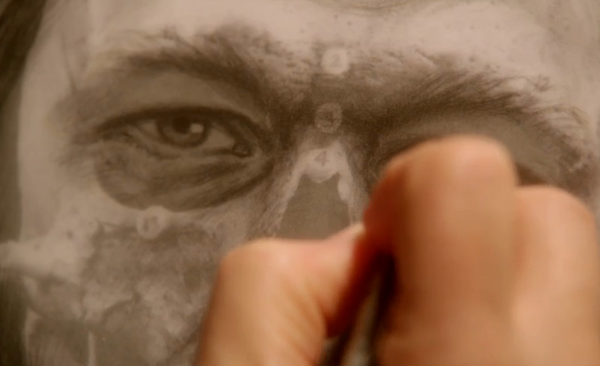 As we have seen in previous episodes, Kate is a pathologist, but her first love is forensic art! Various action shots show Kate diligently drawing. Jeri is so skillful and convincing at doing this “forensic art” that her fans on Twitter have actually asked her if she did the drawings and sculptures herself! 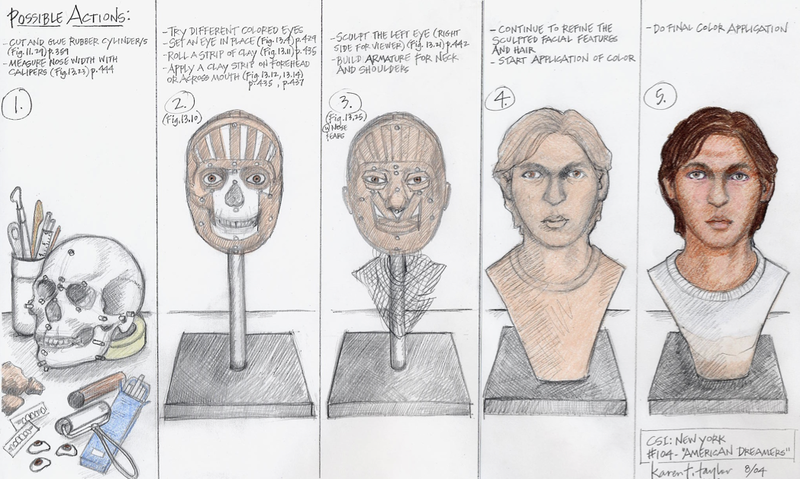 For actual forensic cases, anatomical formulas are used to develop the various facial features, whether drawing or sculpting the facial reconstruction. It is really gratifying when the producers of a scripted television program make such great efforts to authentically present forensic art and facial identification procedures. It is always fun for me when a copy of my textbook, Forensic Art and Illustration, is used on the set in a shot. Thanks to Property Master Chris Call for that! This is a cool view of how it all looks to those talented people involved in the hands-on production of the show. This shows the moment when Dana Delany (as Dr. Megan Hunt) sees Kate’s drawing and makes a mental connection that leads to his identification. She says, “That is the same guy!” And that’s just how forensic art is supposed to work! This is my drawing which is meant to age a young actor’s face by about three decades and show his unique teeth, heavy brow ridge and high cheek bones. This is the young actor, Daniel Blaine, whose face I used as a basis for the aged “facial reconstruction”. I gave input for the casting choice of this actor and he was selected because his face had distinctive bony elements that could be emphasized in the “reconstruction” drawing. He does not have the gappy teeth in real life, by the way. To really understand all of these plot elements, you have to watch the episode! I don’t want to be too much of a spoiler! Actress Jeri Ryan has been so fun for me to work with on this show. She is a real pro…intelligent, approachable and very quick to learn the forensic art actions.